This is a 2-day hunt but since we are running it midnight to midnight it will appear as 4 different hunts. 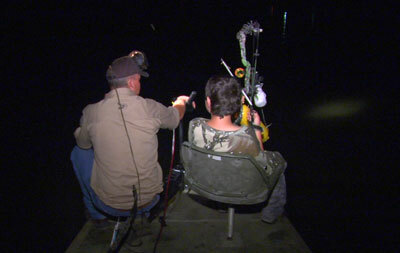 Both my 10 year old son Matt and myself are hunting Alligators in florida using bowfishing gear. 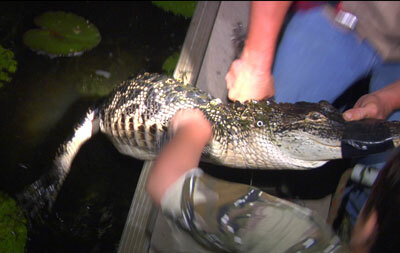 The hunt takes place in late June with TNT gators. Tiger Godwin and Mike Hunter are licensed Alligator trappers in Florida and are allowed to use 'agents' who can assist them with the hunting and killing of Alligators under their permits. However don't be fooled into thinking we are hunting yards and golf courses. These are all fair-chase hunts on large bodies of open waters, areas they call 'open permit' areas. 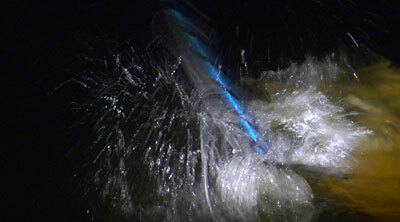 These hunts are conducted exactly the same as you would bowfish for rough fish at night. Only instead of getting a shot at 30 lb carp, you are shooting at a 300lb gator. Unlike carp, these Alligators are extremely nervous and the slightest sound or smell will send them underwater in a hurry. The hunt consists of stalking the gators using a quiet electric trolling motor. You spotlight large bodies of water, swamps and rivers for reflection from a gators' eye and then you quietly move in on him. This hunt will go all night if necessary - and will last for 2 evenings. We are brining you almost every shot on video from Bowhunting.TV. Matt is hunting first. Being a life-long bowfishing nut the thought of using a Muzzy bowfishing point on a 300lb gator was something I really wanted to do. But it took some time for me to find the right outfit and find the right opportunity to get down here to NW Florida near Tallahassee. Tiger had been highly recommended to me by my buddy, CJ Winand, who reminded me (relentlessly) that I should do a live hunt with Tiger and Mike with TNT. The first time we talked I asked him if it was possible for my son, Matt, to come along too? We needed to first check some things out with the Florida Fish and Game but once we confirmed that Matt could hunt at 10 so long as he had is own permit, the trip really started to come together. Matt and I met Tiger this past Friday night at the house they use for their gator hunts. Set next to a small pond, it was a great place, very clean and quiet. Just what we'd need in case we rolled off the water at daybreak. We wasted no time. Matt and I hooked up our gear and before long we were launching the boat on a lake known to have both lots of gators and big ones too! 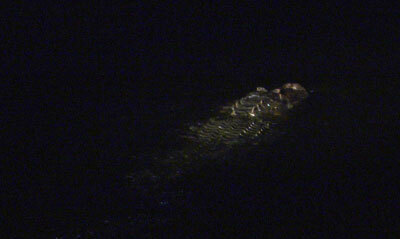 We spotted our first gator not 5 minutes after we launched. It took a while for Matt to get close to his first gator. It was about a 6 footer but he disappeared before we could get within range of his fish arrow. This happened several more times and I realized that this wasn't going to be a walk in the park. But we had so many opportunities that sooner or later, he'd have a shot. It came around 10PM. we moved up on this gator extremely slow and quiet. He posed for us as Mike instructed Matt to draw. He did and the gator never moved. I could tell Matt was nervous because his first shot went high and very far left. What I hadn't realized was it was a 9' trophy gator Matt had just missed. What a beauty! 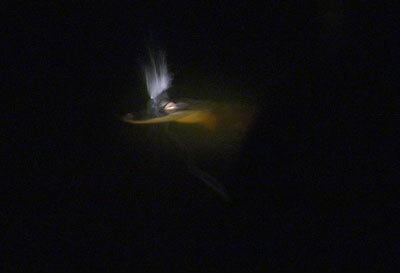 With that big boy at the bottom of the lake - hiding, we went searching for more gators. We found another one no time and Matt overcompensated and shot very low for his second shot. By the third shot I could tell he was getting frustrated so we did our normal pep-talk and reminded him that he needed to do things just like we did with his hog at Shiloh Ranch last year - draw, hold, pick a spot, smooth release. Tiger spotted another gator so we headed over to give him a look. He was about a 6-7 footer and he seemed to be hiding in lily pads. 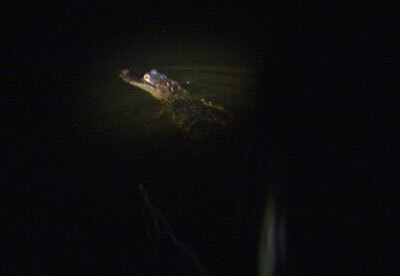 We moved up very quietly until the gator was lit up enough to clearly see him on the viewfinder in my camera. Mike whispered "Draw" and Matt did. I could tell he was focused now, he held his new 45lb Bowtech Equalizer for a good amount of time and the next thing I saw was his Muzzy arrow flying toward the neck of the gator. 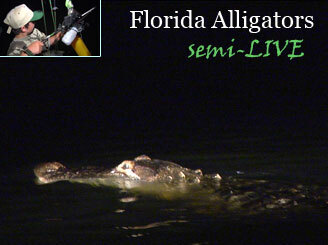 Matt Lefemine shoots a 6' gator with a bow and bowfishing equipment while hunting with TNT gators in florida. What a hunt! These guys were terrific! Video Not Showing up? It could be your company's firewall. Click Here for Alternate Link. Only Mike had a clear view and he knew right away that Matt had nailed him! 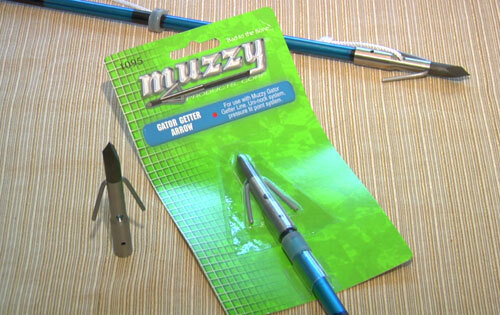 The Muzzy Gator head had penetrated the neck and basically knocked out the gator. Matt didn't know what to think as he pulled the prehistoric reptile up to the boat. We were all thrilled for him! And once again I was as proud as I could be for my son. With Matt's gator wrapped up and stored away on the boat, it was now my turn to try Gator hunting. 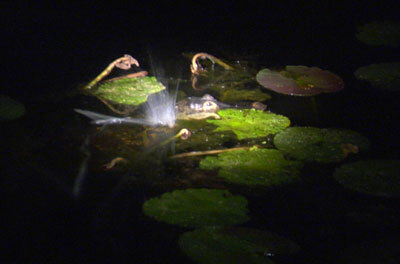 It was getting late, almost midnight when Tiger spotted a BIG gator swimming across the massive lake. They both said he was big by the wake and the distance between the eyes. I couldn't tell until we were inside of 20 yards and I could see how wide his back was. I checked one last time that nothing was tangled on my recurve as I approached the beast. I drew, picked a spot, and hammered the gator right in the soft spot behind the next. 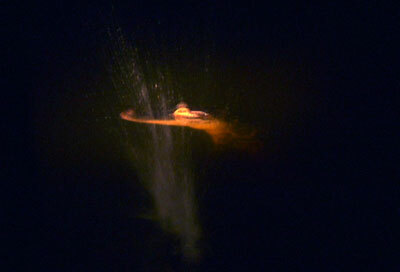 The gator exploded on the water and headed below. He stripped all of the line off of my reel and pulled a Muzzy Gator Kit float into the water. This happened so fast I almost didn't get it disconnected from my bow in time. Now that would have been a problem. My float was racing through the water and Tiger throttled up the trolling motor to chase it. He was definitely Cpt. Quint and I was Chief Brody as we chased that buoy across that lake. Glancing at my watch it was now after midnight and I was chasing just a monster Alligator for the first time in my life - and loving every minute of it! Tune in tomorrow to see what happened after Midnight. 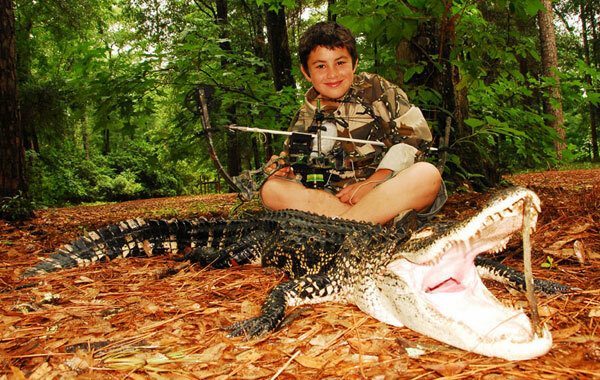 10 Year Old Matt Lefemine with his first bow-killed Alligator!